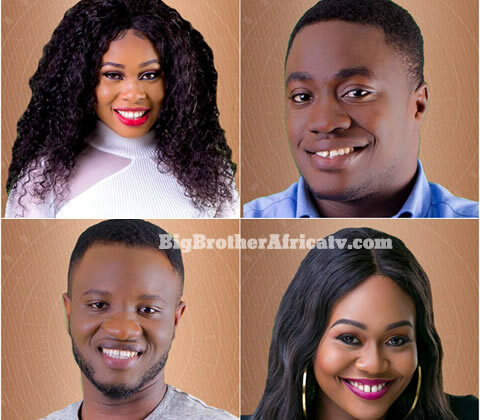 The first Live Eviction Show saw Princess, Bitto, Vandora and Dee-One exit the Double Wahala House. Big Brother Naija 2018 never disappoints when it comes to a Live Show and tonight was no different. From superstar performances, Evictions and all the usual glitz and glam, tonight was a night to remember. Tonight it was Prito and Van-Dee who were Evicted from the Big Brother Naija House. It was a thrilling and emotional 90 minutes. Ebuka, who was dressed to the nines as usual, addressed the fact that the entire House was up for Eviction (excluding LeoLex who were saved by HoH). The first pair to leave the House was the ever vibrant Prito. It was a tense moment as Ebuka first saved Rihneeka and Mina, he then delivered the news that shook everyone to their core. Everyone bid them a beautiful farewell and they exited the House with grace. During their time on stage with Ebuka Bitto seemed happy that he had at least two weeks in the House while Princess was visibly more upset and said that she would of liked more time in the House. The week that was made for a myriad of love, hate, secrets, strategies and birthdays to boot. There was no shortage of entertainment from our 20 Housemates as they went through all the motions. After running through the rather puzzling Arena games, Ebuka moved on to the second Eviction. BamTeddy and Loto were named as safe as we were left on the edge of our seats awaiting the final verdict. The Housemates were visibly shook as Ebuka announced that Van-Dee would be the second pair to leave the House. After some tears and an emotionally charged goodbye, they exited the House and joined Ebuka on Stage. Both Vandora and Dee-One were upbeat during their on stage interview and even shared a laugh about the contentious topic of Dee-One's marriage outside the House. What was your favourite moment of tonight's Live Show? To get the latest news and Big Brother Naija/Nigeria 2018 Updates, kindly subscribe to receive email updates from www.BigBrotherAfricatv.com. Please Like us on FACEBOOK: Facebook.com/BigBroAfricaFans & Follow us on Twitter @BigBro_Africa for more spicy Big Brother Nigeria 2018 News and Updates.